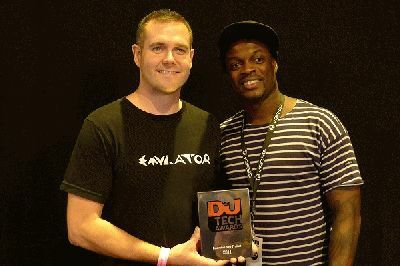 DJzone DJ Magazine :: Emulator Wins DJ Mag Tech Award!!! Every year, DJ's from all across Europe flock to the small city of Birmingham smack dab in the middle of the United Kingdom for the BPM Show held at the National Exhibition Centre (NEC). DJ legends, Grandmaster Flash and Pete Tong were on hand to impart their wisdom and skills upon the youth of the DJ world in the Gatecrasher Arena. One of the highlights of the show had to be the judging of the prestigious DJ Mag Tech Awards. Companies competing for the highest tech honours included Numark, Pioneer, Serato, Stanton, Vestax and of course Toronto, Canada based, SmithsonMartin Inc. SmithsonMartin's first product Emulator was up against some fierce competition with the Stanton SCS.4 and the Pioneer DJM-T1, but no one could deny that the most innovative product of the year was the first of a kind, "Star Trek Like" multi-touch DJ system, Emulator. "We are so proud to be recognized by our peers as the most innovative product of 2011. Companies that win Tech Awards typically go on to do great things and we are so excited about the future of touch screen DJ'ing." said SmithsonMartin CEO, Alan Smithson "I am thrilled to announce that we will be releasing the Modular version of Emulator where users can fully customize their touch screen DJ experience for any midi software". "Emulator is the only product in the history of DJ'ing that unites the DJ with the crowd visually. The union of music, visuals and the work of the DJ become one unlike anything else that has ever existed before." Said Emulator creator, Pablo Martin "We have been working around the clock to deliver the most accurate, flexible midi controller ever made."